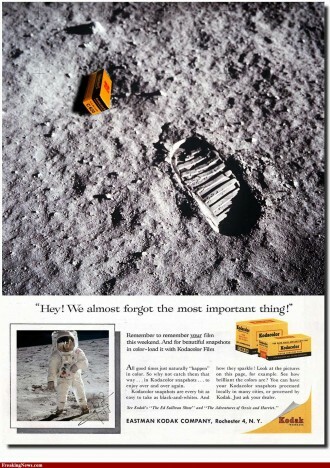 Home » Photography News » Kodak the end of an era – is the iconic yellow box dead? 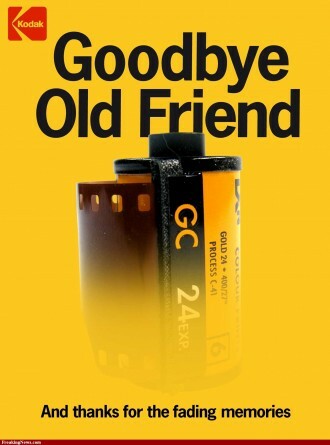 Kodak the end of an era – is the iconic yellow box dead? 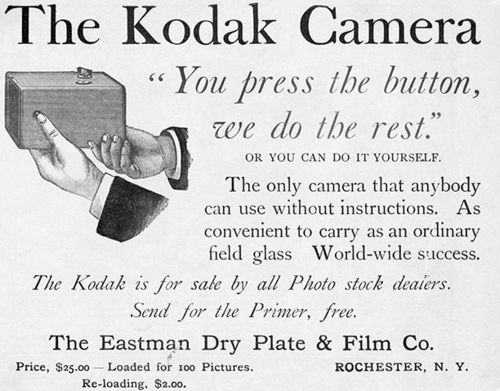 Forewarning, this article will really appeal to anyone born before about 1975, and is a bit of a rant and reminisce about the seeming impending demise of the once photographic giant, Kodak. For those of you born after 1975, if you'd like to know more about what it was like for your parents growing up, read on. You might learn something, or at the very least find it amusing. For those of us pre-1975 let's go on a journey and remember “the good old days”. I'm sure you've already heard that Kodak filed for Chapter 11 bankruptcy in January 2012, that's not new news. I'm not going to talk about that, you can read all sorts of articles on that (read more on the Kodak site if you want to read know the details). I'm going to talk about my experience with Kodak and what it means to me and those of us the remember film. I don't know about you but I grew up in a house where we had such cameras as the Instamatic (not the iPhone app, that's Instagram), a 110, old movie film cameras, and when I was 16 I received an old 35mm camera (I think the brand was Yashica). We didn't take a ton of photos though because you had to pay for the film and processing of every shot you took, so we were much more selective of the photos we snapped. It wasn't uncommon to take out a roll and get it processed only to find Christmas, Easter, Thanksgiving and Christmas again all on the one roll of 36 exposures. Yup that was it, 36 per roll max! Now with huge capacity memory cards for digital cameras you can capture 1000s of images before you even need to “reload”. That's just one of the big changes we've seen in our lifetimes. Another big difference is that in order to see your images you had to take the film to the lab to get processed and get a small print made of each image. 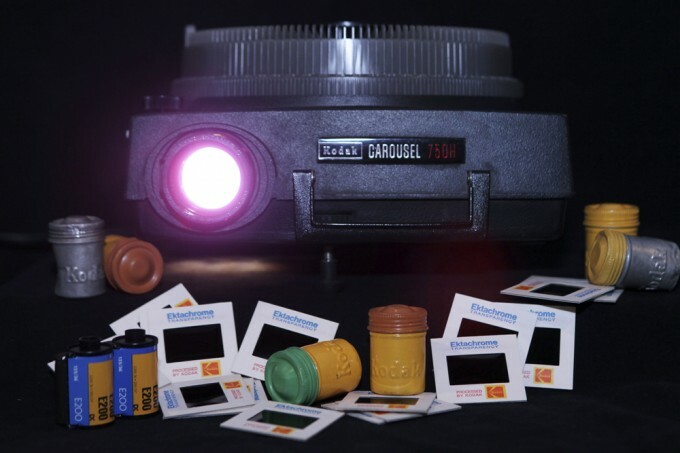 Or you could use slide film which gave you a small positive image or slide, mounted in a little plastic sleeve which you viewed using a projector. My parents took slides of their Hawaiian vacations and we'd sit around in a darkened room and all view them together as a group or when they had friends over. Now I find that hardly any, or a very small percentage, of images taken by most people ever get printed – I find myself guilty of doing so also! 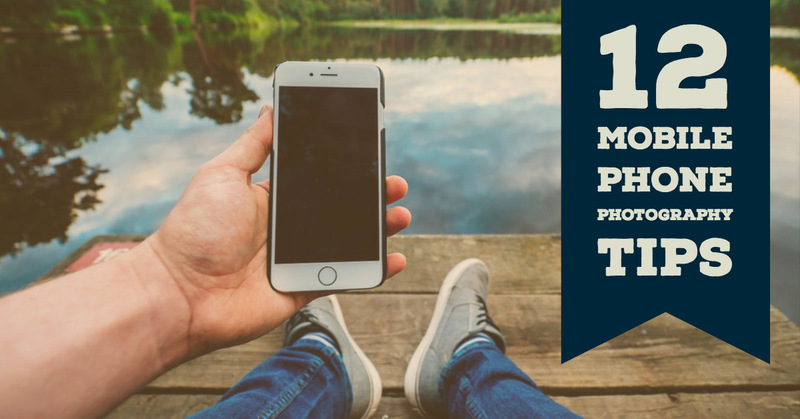 We share images online, email them, post them to Facebook or a portfolio, or even text them to each other. 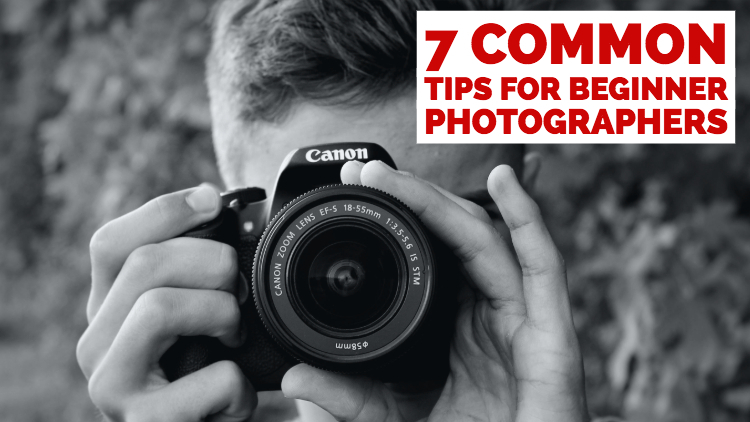 I'm not saying one is better than the other and I certainly make full use of many electronic ways to share images – they're just different. In the fall of 1986 I entered a two year photography program at Nait. We started out learning entirely on a 4×5 view camera and doing only black and white for the entire first year. We processed our own film and made our own prints by hand in small trays. The darkroom was a long row of sinks with multiple bays for all 25 or so of us to work in the same room together. It was not work, it was fun, and I loved putting my hands right in and watching the magic as the image appeared on the paper time and time again. I never got tired of seeing that happen. I remember buying tons of boxes of film, paper and chemicals many of which had the familiar red and yellow logo and packaging. Fuji was a major competitor of Kodak in the film and paper market, but I always preferred the warmer tones of the Kodak products, especially for people photos. 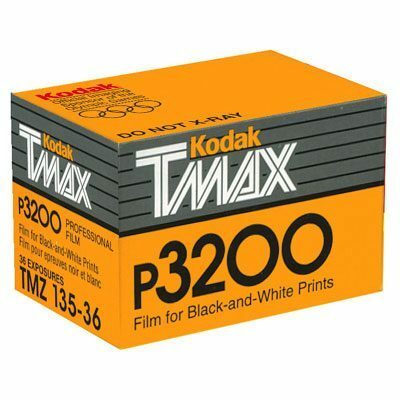 Some of my favorite products were Kodak Tri-x Pan (ISO 400 BW film), Kodak Porta 100 and 400 color negative film, then later the T-max line of BW films including the incredibly high speed T-max 3200 for 35mm. At the time it was the highest speed film you could get, period. It could even be pushed (underexposed and overdeveloped in processing) and shot at ISO 6400. It was pretty grainy, but I loved the look of it and being able to shoot in low light conditions without using a flash. I started using it at my weddings long before most photographers in my area were even using 35mm at weddings (medium format was the standard then). I actually even remember getting an audible “gasp” when I mentioned it at a dinner meeting of professional photographers. It was shunned, and perhaps I was too, because it was considered too low quality to be professional. 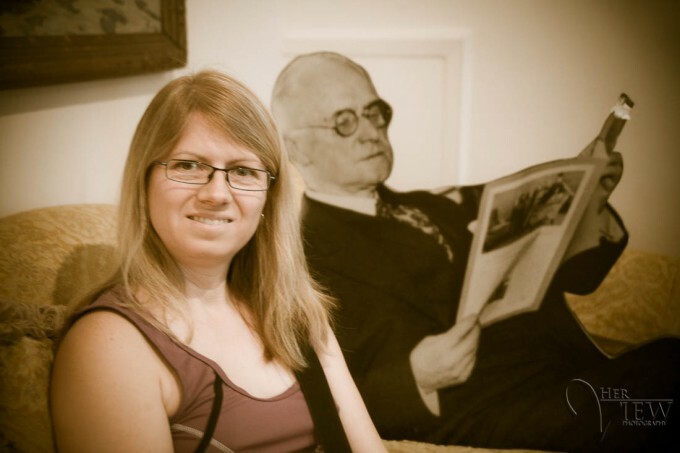 But the thing was – my clients loved the images, and so did I! There's a lesson in there somewhere for you if you dig for it. Don't let other people tell you how to shoot, what to shoot or why. 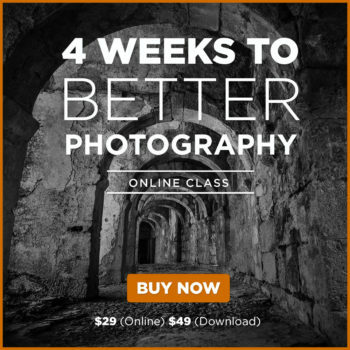 Sure there's value is knowing how to create high quality images and what that means. Sure there's value in knowing the rules first before you attempt to break them. Sure there's value in listening to those that have more experience and knowledge. However . . . Anyway, some of my fondest memories of my photography school years are in the darkroom. 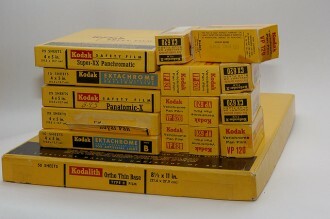 I have heaps and heaps of old prints I can't bear to part with just yet, stored in emptied yellow and red Kodak boxes. I have a medium format Hasselblad camera that's basically a paperweight now. I probably even have some left over film somewhere. 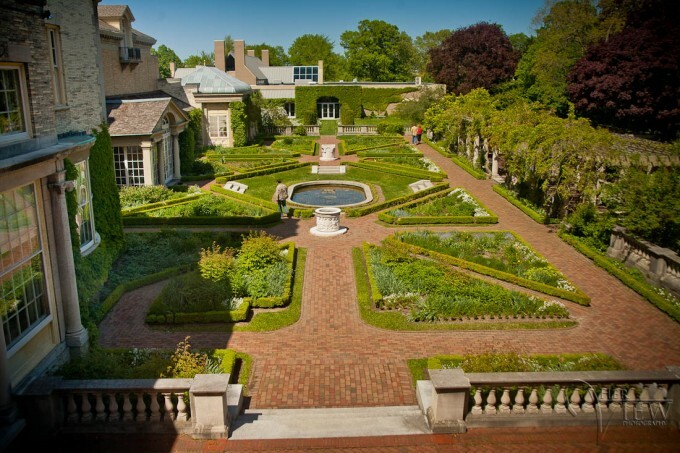 I was really thrilled to get a chance to see the George Eastman house in Rochester, NY last spring. The place where the man who ha such a big part in photography's history lived, and created, and dreamed. 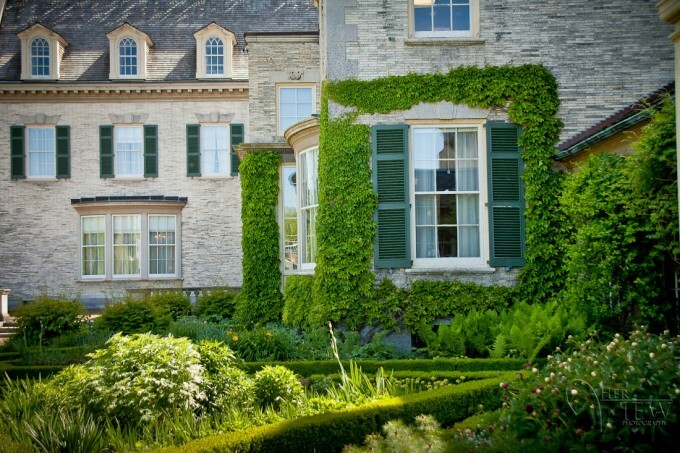 This month's April 2012 wallpaper is an image of the house if you'd like to enjoy it on your own computer I encourage you to do so! 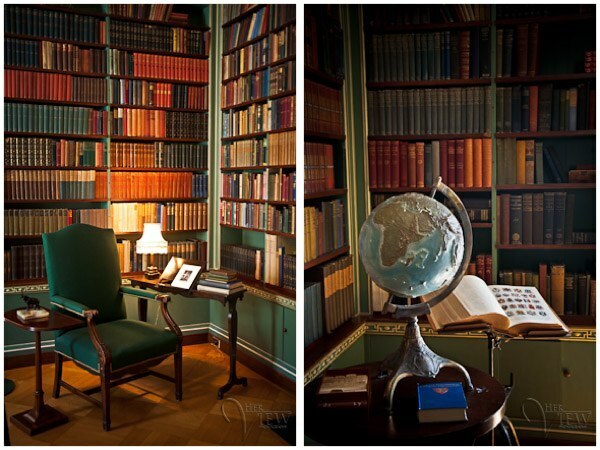 Here are a few more images taken at the house. 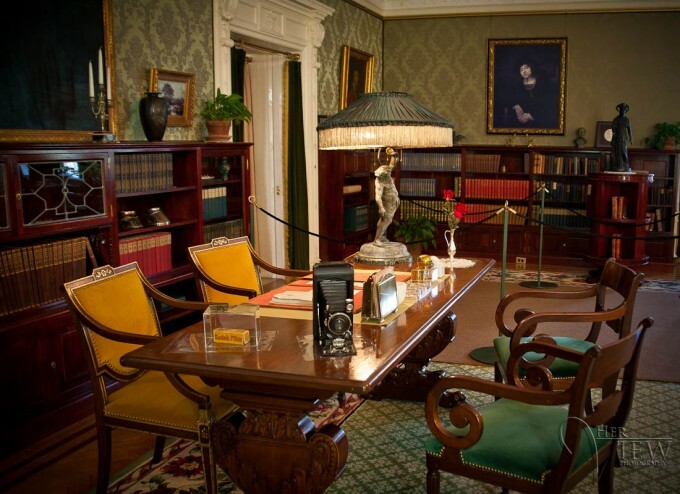 One of the Studies in George Eastman House, notice the camera and roll of film on the desk! Kodak stock peaked at over $95 drops to 30 cents! The sad thing about what's happened to Kodak is how complete the collapse has been. 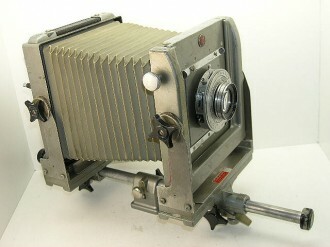 At their peak Kodak shares went for as much as $94 or more. 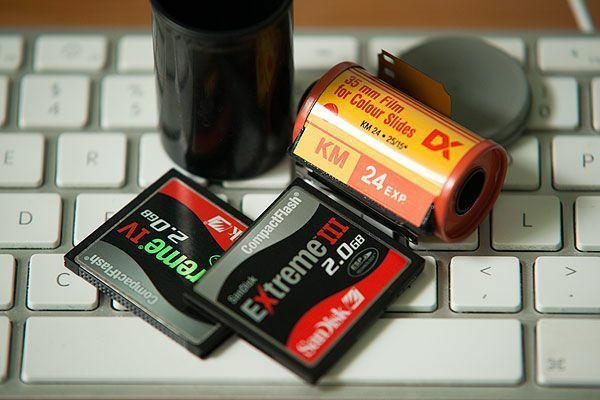 In late January after their notice of bankruptcy the shares fell to an all time low of $0.30 and Kodak was officially removed from the New York Stock Exchange. 15 years ago in 1997 Kodak had more than 60,000 employees in Rochester (main home of Kodak plants), now it's less than 7,000. Imagine how that has affected that city's economy to lost so many jobs! I collect old cameras and have some of the original Kodak ones with the folding bellows, a couple of Brownies, a Polaroid (another company pushed out of the photography industry) camera, and some others. I guess it's time to add all the film cameras that I used “back in the day” to that collection of antiques, because the revolution really is over. 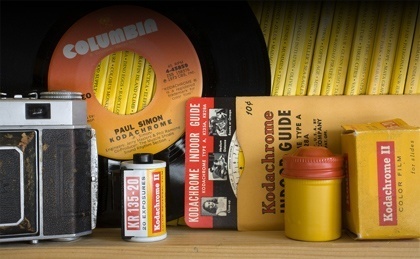 It's not certain if the fat lady has sung yet for Kodak but the company will never be what it once was, an industry leader. But I'll still have my boxes of prints, and now maybe more than ever I want to hang on to them. As I said at the beginning, it's the end of an era and a sad one indeed. Will we still hear the phrase “it's a Kodak moment”, and will Paul Simon still sing “Kodachrome” with the same enthusiasm? Will the next generation even know the name and it's importance in history? I hope so! Tell me how this news has affected you. 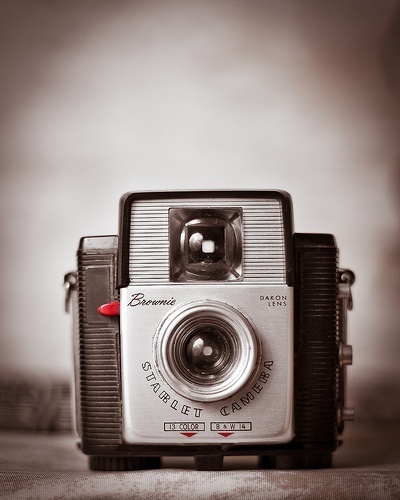 Share your favorite Kodak moments here and please share this article.